Carles Brasó Broggi first contacted our group in June 2013, so very early in its short life, and in pre-website days. He was then researching for his PhD and was based in Shanghai. He was particularly interested in the spinners that came from Shanghai at the end of the 1940s to Hong Kong to build its first spinning and weaving mills. He has written specifically for our website and his Shanghai Spinners: Pioneers of Hong Kong’s industrialization, 1947-1955, remains the most widely read of all our individually authored articles. It was also self-posted. 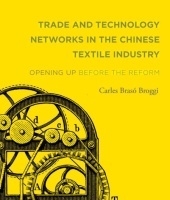 I am therefore very happy to publicize Carles’ recently published book Trade and Technology Networks in the Chinese Textile Industry: Opening up Before the Reform. The blurb says: The aim of this book is to track the historical origins of China’s economic reforms. From the 1920s and 1930s strong ties were built between Chinese textile industrialists and foreign machinery importers in Shanghai and the Yangzi Delta. Despite the fragmentation of China, the contribution of these networks to the modernization of the country was important and longstanding. Facing the challenge of growing in a fragmented country, Chinese textile firms such as Dafeng, Dacheng and Lixin focused on urban markets and also on importing technology for upgrading their production. When the war against Japan blocked trade routes inside China, these networks were concentrated in Shanghai where they envisaged an export-oriented development strategy for China that was based on importing machinery and exporting manufactured products. However, this strategy was only implemented precariously in Shanghai, while the city stood as a neutral space in the first years of the Japanese occupation, but was only consolidated in Hong Kong in the late 1940s, where textile industrialists and most of the foreign importers migrated. These networks were thus reestablished in Hong Kong, where they contributed to the city’s industrialization in the Cold War period. Meanwhile, the Chinese industrialists that stayed in Shanghai and the Yangzi Delta had to adapt to the Maoist regime and were progressively incorporated into the state-owned companies or the local government agencies such as the United Front or the Textile bureaus. However, from the early 1970s, the links between Hong Kong and Shanghai were reactivated and these networks played, again, a key role in the modernization of China, especially regarding the imports of technology and exports of manufactured goods. The book ends with the first joint-ventures between Hong Kong businessmen and Chinese local administrations that took place in the beginnings of China’s economic reforms in 1979.